It is almost certain America’s ally Egypt will become an Islamist state if last week’s vote is any indication. President Barack Obama, who supported Egypt’s revolution, had better prepare for a radically different Middle East. An Islamist Egypt, the largest Arab country and a longtime American ally, could turn the Middle East on its head. It will likely exchange the 30-year peace with Israel for war, play host to Islamic terrorists, embrace Sharia (Islamic) law, limit the use of the strategic Suez Canal, and spread radicalism across the volatile region. Last week’s mostly urban vote was the first of three rounds of Egypt’s complex parliamentary elections to fill the People’s Assembly (the lower house). 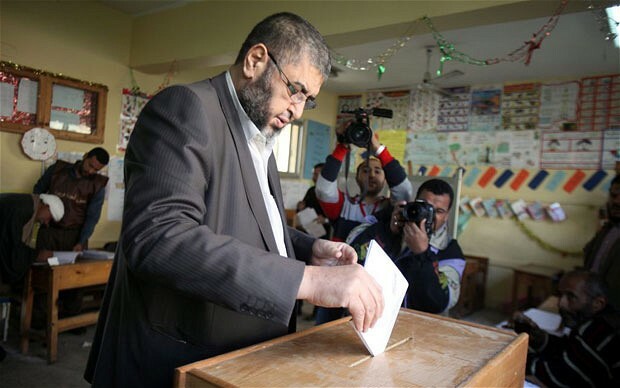 The Islamist Muslim Brotherhood’s Freedom and Justice Party (JFP) captured perhaps 43%, and surprisingly, the ultraconservative (Salafist) Al Nour (“The Light”) party earned as much as 30% of the vote. The final two voting rounds will take place between now and early January, and are expected to be even more successful for the Islamists because the remaining voters are in primarily rural, conservative governorates. And there is no reason to expect the election for Egypt’s upper house, the Shura Council, which takes place between late January and March, to be any different. It is clear Egypt faces a cultural and political tsunami. An Islamist majority parliament will ignore the Tahrir Square pro-democracy movement that pushed former President Hosni Mubarak out of office. Worse, the more moderate Muslim Brotherhood will be pushed to the Islamic right by its Salafist allies. Then expect the Islamists to display no pretense about embracing radical Sharia law. One of the best indicators of Egypt’s “destiny” is what the Islamist leaders promise. Badie said the Koran should “become our constitution,” and in 2007 then-supreme guide Mohammed Mahdi Akef drafted the Brotherhood’s political platform. That platform states Islam will be the state religion and that Sharia “is the main source for legislation.” Non-Muslims and women are barred from the presidency, and the 1979 peace with Israel would be put to referendum, which means certain defeat in the 95% Muslim majority country. And tourists visiting Egypt must “be in line with Islamic principles, values and laws,” which would put a serious damper on Western tourism. The most prestigious Brotherhood cleric, Shaykh Qaradawi, represents mainstream views, according to the Washington-based Brookings Institute’s Shadi Hamid. Those views are radically anti-Israel. Qaradwi denies Palestinian suicide bombing attacks on Israeli civilians constitute terrorism, and he issued a fatwa (an Islamic ruling) stating that it was mandatory for all Muslims to support Iran terror proxy Hezbollah in its fight against Israel. Recently Qaradawi, who heads of the Union of Muslim Scholars, co-sponsored a massive rally in Cairo’s Al-Azhar mosque in which a 5,000-strong crowd chanted passages from the Koran vowing that “one day we shall kill all the Jews,” according to Israel's Ynetnews. The theologian also embraces radical views for everyday Egyptians. He “accepts” wife beating “as a method of last resort,” according to London’s The Guardian, and female circumcision for “whoever finds it serving the interest of his daughters.” He also believes that homosexuality should be punishable by death. The Brotherhood’s Salafi partner, the Al Nour party, is the largest of Egypt’s three licensed Salafist parties and perhaps the most dogmatic. It calls for laws mandating a shift to the complete application of Sharia, including Islamic banking (no interest or fees for loans), “just and equal distribution” of income to the poor, restricting the sale of alcohol, providing special curricula for schoolchildren, and censoring the arts and entertainment. Sheikh Yasir Burhami, considered Al Nour’s godfather, previously rejected participation in politics and government because it conflicted with his religious principles. But he reconciled participation in the current election process by rejecting democracy - the rule of the people - while embracing democracy’s methodology (elections), which “seems to be the best option available, or the lesser evil,” Burhami said. Burhami advocates this “lesser evil” (elections) in order to change the basis for Egyptian law. In a March interview on Al-Khaleejiah television, Burhami explained that under Islamic rule, laws are based on the Koran and the Sunnah, the practice of Muhammad. Under democracy, he explained, it is the will of the people that he rejects. But then he implied Salafis joined this election as a means to leverage their popularity in order to change the basis for Egyptian law. Al Nour’s platform states “there is a broad popular consensus among all sectors of Egyptian [society] regarding establishing Islam as the state religion, Arabic as the official language, and the principles of Islamic Sharia as the primary source of legislation." "We believe that Islam is the decisive [authority] in all domains of life, including politics,” Burhami said. He argues that Islam is “both religion and state,” and cannot be separated from politics. He believes secularism amounts to atheism. There are at least five consequences of an Islamist Egypt. First, the Islamists will adopt a Sharia-based constitution that radically transforms the country’s security and trade arrangements, as well as the way it treats minorities such as Coptic Christians (who are already leaving the country), as well as women. Keep in mind regional trade depends on Egypt’s Suez Canal, and vacating the 1979 Camp David Peace Accords with Israel, which the Salifists reject, could return the region to a war footing. Second, an Islamist Egypt would realign partnerships. Cairo would grow closer to the Palestinians, Syria, Lebanon, Islamist Libya, and radical Iran, while becoming hostile to most of the West. Third, an Islamist-controlled Egypt would eventually purge its American-trained and -equipped military, much like the transition that is now happening with Islamist Turkey. Egyptian guns could soon be pointing at Americans. Finally, Salafi terrorist groups would find safe harbor in Egypt, the ideological home of al-Qaeda. That would radicalize the region and could turn Egypt into another terrorist haven like Pakistan. The wild card in this political tsunami is the SCAF, which has goals starkly different from the Islamists, such as maintaining secular rule. Will it allow the Islamists to radically transform Egypt? Recently the Obama administration called on the SCAF to transfer power to a civilian government “as soon as possible.” That may happen, but as the consequences of an Islamist Egypt play out, everyone should remember a similar transition 32 years ago in Iran. It appears Obama never learned the lessons of his predecessor President Jimmy Carter, who badly fumbled the Iran crisis. It now appears Obama is doing the same with Egypt.